Well, after a hat trick of a weekend – that’s 3 weddings back to back! – its nice to relax on a Sunday evening and do a little blogging. 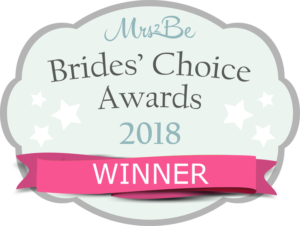 Thursday’s wedding video in Kilkenny was a fantastic day, I would think its 50/ 50 with wedding videos in Kilkenny and in my own county of Tipperary, I have always been lucky enough to be filming a large amount of weddings in both county’s but of late Kilkenny is very popular with a large number of couples booked in for 2015 and 2016 so happy days! OK, I know I crossed over the border into county Kilkenny for the wedding of Allison & Brian, but it was worth it. I started filming at Allison’s home that morning, just off the Kilkenny-Mullinahone road, to capture the girls getting ready for the big day. It’s a great way to start a wedding video as its shows where it all begins. The girls were well on the way to looking great when I arrived and, with Allison getting her dress on, I left for the church to find the lads. The day was lovely with blue skies and everyone was in fantastic form and looking forward to the wedding. Brian arrived with the lads close by. I had a bit of banter about Tipperary and Kilkenny with the famous hurler and his groomsman, Tommy Walsh. But, as I was in their turf, I left it well enough alone 🙂 St. John’s Church was the venue with Fr Sean O Connor who I meet quite a lot while filming wedding videos in Kilkenny. He is very nice, easy to work with and great fun as well. Their photographer for the day was the famous John McIlwaine . 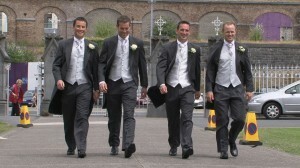 I have worked with John on many famous weddings in and around Kilkenny. 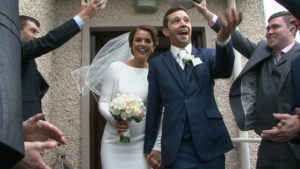 John is a fantastic and famous sports photographer all over Ireland and Allison & Brian wanted no one else to capture their day. John is so easy to work with and is like lightning to capture those all important shots of the day. As Brian and the lads were being lined up for their photographs, I was capturing their guests arriving. I have seen quite a lot of large weddings in my time, but this one was the biggest I have seen so far. The guests were from all over the globe; of course, Kilkenny – Tipperary, I’m not so sure – but USA, Australia and lots more far off places. The couple asked to stream live over the net so that some of their friends abroad could see, so Fr. Sean got the guests to turn around and wave at the camera that was placed at the back of the church. This went down very well. 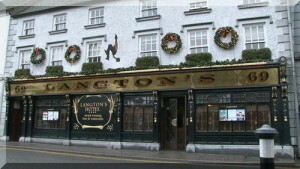 The couple chose Langton’s hotel in the heart of Kilkenny city to have their reception. Again, I have never seen this hotel looking so well and so packed. Even the outer area of the hotel function room had places set for guests to sit at. I like to be at the hotel before the couple arrive. This way, I get to film the guests enjoying the food and drink the bride and groom have put on for their guests. As it was a lovely day, all of the guests were outside enjoying themselves with a musician entertaining them while they awaited the couple’s arrival. This is just part of the “set” as its called in Langton’s hotel. It’s a magnificent set up and well worth a visit as there are lots of popular shows on around this time of year. Bridie’s Bar is always a big hit with weddings in Kilkenny to have a photograph taken outside with the old bicycle. Sean was on hand to look after the bride and groom for the evening and he is always so helpful on the day. A short time later, the bell rang for the guests to enter the dining room. What a fabulous job the staff made of the function room. Allison chose to carry out the speeches before the meal. 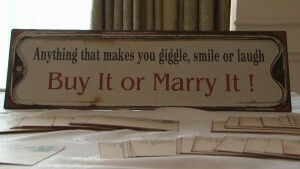 This has become very popular with weddings in Tipperary, Kilkenny and Carlow. It’s a great way because the lads can enjoy their meal knowing the speeches are over and they can relax. I also find its handy for us video guys as well. Also, the guests are awaiting their dinner and are a lot more alert to the speeches. It’s well worth a thought for you brides and grooms to have the speeches before the meal.